Removable Glue Dots Sheet are clear-lined, double sided adhesives that bond instantly to most clean, dry surfaces. 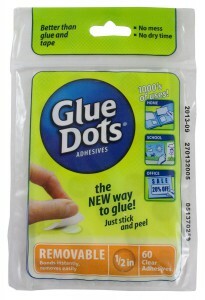 Glue Dots stay secure and replace messy liquid glues, requiring no drying time. Removable Glue Dots use a lightweight glue formula making a loose bond for transitional projects. Unlike tapes and putties, Removable Glue Dots can be removed easily without staining or leaving behind a sticky residue. These Dots are acid and lignin free, non-toxic, and photo safe. They bond easily, the pressure sensitive dots are perfect for the office, school and home. They also adhere to paper, vellum, fabric, wood, foam, plastic and more! They are ideal for kids, with no fumes, no mess and no drying time. Package contains 60 Dots, 1/2 inch diameter.